Below is the rush transcript of "This Week" on August 10th, 2014. It may contain errors. ANNOUNCER: Right now on ABC's "This Week," fair strikes. BARACK OBAMA, PRESIDENT OF THE UNITED STATES: I don't think we're going to solve in weeks. I think this is going to take some time. ANNOUNCER: U.S. fighter jets back in the skies over Iraq dropping bombs to protect American citizens and prevent a humanitarian catastrophe. Breaking details on the dangerous mission. Ebola emergency: the latest on the desperate effort to contain the growing outbreak. Are we prepared for a new virus threat? Plus, gamechanger -- the NCAA told it must allow athletes to be paid. Will college sports ever be the same? This morning, an ABC News exclusive, the president of the NCAA here live. MARTHA RADDATZ, HOST: Good morning, great to have you with us. I'm Martha Raddatz. We begin with the latest on the New U.S. mission in Iraq. This weekend, more U.S. airstrikes against ISIS militants, plus new air drops of humanitarian aid to help thousands of civilians trapped on a mountain by ISIS fighters. And just overnight, the UN telling us at least 15,000 civilians have been able to escape. Meanwhile, President Obama is warning U.S. military action in Iraq is a long-term project. Chief White House correspondent Jonathan Karl has the very latest with the president on Martha's Vineyard. JONATHAN KARL, ABC CHIEF WHITE HOUSE CORRESPONDENT: Overnight, the Pentagon released new information on the latest air strikes against terrorist targets in northern Iraq. At 11:20 Eastern Time, fighter jets and drones destroyed an armored personnel carrier threatening an Iraqi minority group. Twenty minutes later, U.S. aircraft struck three more targets with a follow-up strike destroying another. At 3:00 p.m. Eastern, the final target of the day was demolished. President Obama bluntly acknowledged there is no foreseeable end to U.S. military operations in Iraq. OBAMA: I'm not going to give a particular timetable, because as I've said from the start wherever and whenever U.S. personnel and facilities are threatened, it's my obligation, my responsibility as commander-in-chief to make sure that they are protected. KARL: A key concern, the U.S. consulate and hundreds of Americans in the city of Erbil, the capital of the Kurdish area in northern Iraq and once thought to be Iraq's safest city is now threatened by Islamic militant group ISIS, fighters whose ferocity the president and his advisers had low-balled. OBAMA: There is no doubt that their advance, their movement over the last several months has been more rapid than the intelligence estimates than I think the expectations of policymakers both in and outside of Iraq. KARL: President Obama reaffirmed his promise not to send in ground troops and had this message for critics who say the U.S. would be in a better position is all U.S. troops had not been withdrawn. OBAMA: The only difference would be we'd have a bunch of troops on the ground that would be vulnerable. KARL: The U.S. is also dropping relief supplies to a minority group trapped on a mountaintop. The UN now says more than 15,000 have been rescued, but thousands are still in jeopardy. And U.S. planes are at risk, too, on these missions. UNIDENTIFIED MALE: These cargo airplanes, which are not very maneuverable and do not have the same defensive capabilities that, say, a fighter jet does have to get very low and very slow to the ground and they have to open up the back, the ramp, and they have to push things out. And so they're actually more vulnerable. KARL: The president is here on Martha's Vineyard for his family vacation. He's already played a round of golf, but White House advisers say that he is closely monitoring military operations over Iraq and receiving regular briefings. He has brought key members of his national security team with him to the vineyard, including National Security Adviser Susan Rice -- Martha. Now let's get the very latest on the ground in Iraq from Matt Bradley of the Wall Street Journal. Matt, give us a sense of how concerned people are about Erbil. MATT BRADLEY, WALL STREET JOURNAL: Well, we have to remember that Erbil was a flourishing city that was growing economically over the last 10 years, especially in relation to Baghdad and some of these other southern cities where I am now, that's it's not quite clear whether or not the peshmerga units who are there, these Kurdish fighters, will be able to defend the city. It's come as a major, major surprise that this ragtag group of Islamist militias were able to make some serious military gains against the peshmerga just in the last week. So, it's -- it is a major concern that Erbil could fall, especially considering that these guys are only about 30 minutes away. RADDATZ: But you've got these airstrikes going on. You've got these stranded people on Sinjar Mountain, this is going to be a long-term commitment no matter what, it seems, from the U.S.
BRADLEY: That's what President Obama was saying in his speech yesterday. There's no real short-term solution to this conflict. We could say that this conflict could look like Libya where the United States' intervention is confined just the aerial bombardments, but really the crux of the fight is going to have to come down to the Iraqi military, which has fled in the face of the Islamic State militants over the last two months and the Kurdish peshmerga who have really shown themselves to be outgunned and outmaneuvered by the Islamic State. They are a formidable military force and it's going to be very hard to see how the Iraqi army and the peshmerga are going to be able to win back some of the land that they've already taken. RADDATZ: Thanks very much, Matt. Now for more on the strategy in Iraq, General Carter Ham who commanded U.S. and coalition forces in Mosul, and Christopher Hill is a former U.S. ambassador to Iraq. I want to start with you, General Ham, you know Mosul, Erbil, that area so well. I spent a lot of time there with you over the years. As you look at these small strikes on artillery, mortar positions, can they really have a long-term affect on ISIS. GEN. CARTER HAM, FRM. U.S. COMMANDER IN MOSUL: Martha, I think the initial strikes are already having some effect. A few strikes by the United States, many more by the Iraqi air force which is encouraging, it appears to have at least given pause to the Islamic extremists as they seek to advance toward Erbil and other cities, but much more effort will be required to achieve a positive outcome longer-term. RADDATZ: Or long-term effect. Is there a danger of mission creep here? HAM: I don't think so. The president, of course, has very clearly stated no combat forces, but here remains to be seen how much support the United States is ready to provide, in my view, first to the Kurdish regional government in Iraq and their armed forces, the peshmerga, but longer term to help hopefully a new Iraq government rebuild the Iraqi military. RADDATZ: But you heard what the president said his goals were -- protect Americans, stop the humanitarian crisis, don't allow safe havens and protect the infrastructure like the Mosul dam. How can you accomplish that without combat troops? And how long does that take? HAM: It will be very difficult without U.S. ground forces or ground forces of others, which may -- they may be willing to participate, but it really centers around what the, I think, the president is right, there has got to be a responsible government in Baghdad to which a future Iraqi army can be loyal. I think that was the underlying cause for their very quick evaporation under pressure from the Islamic extremists. RADDATZ: And Ambassador Hill, I want to play part of an interview I did with the current U.S. ambassador in Iraq, Steve Beecroft. I did think this in January. And even then, he seemed to be waving a red flag about the violence there. RADDATZ: How concerned should Americans be about what's going on here now. STEVE BEECROFT, U.S. AMBASSADOR TO IRAQ: Well, we have real interests in the Middle East and we have real interests in Iraq. Those aren't going to go away any time soon. We should be very, very concerned. RADDATZ: Ambassador Hill, should the U.S. have been paying more attention to Iraq? CHRISTOPHER HILL, FRM. U.S. AMBASSADOR TO IRAQ: Well, first of all I think people are paying attention to Iraq, but there are a lot of other crises in the world that may have drowned it out somewhat or reduced the bandwidth for Iraq, but certainly this is a problem that is not just in Iraq, it's a broader problem, ISIS, whatever its origins, it's pretty clear that it is part of a situation in Syria that has metastasized into Iraq. And frankly speaking, although I think an improvement or the naming of a new prime minister not named Maliki might be helpful, I don't think it's going to in and of itself solve this problem. RADDATZ: Well, let me tell you something that Hillary Clinton told the Atlantic. She said the failure to help Syrian rebels led to the rise of ISIS. Do you agree? HILL: I would put it a little differently. First of all, the idea that you can arm some rebels and not others I think is a difficult proposition in and of itself. I think the failure to focus on Syria, the failure to come up with a political or diplomatic way forward -- after all, if Bashar al-Assad were hit by a bus today, there would still be a problem in Syria, because no one knows what that country is going to look like in the future. And so the failure to come up with any kind of forward looking diplomatic plan keeps people out there fighting, because they have no confidence that the international community is coalescing around anything. So I think that's the major problem in Syria, more so than the idea that we haven't put more weapons out on the battlefield. RADDATZ: And General Ham, I just want to quickly talk to you. were the commander of Africom during Benghazi. This certainly has had an effect on the president's decision, according to some senior policymakers. What lessons learned there when you look at Iraq? HAM: Well, the circumstances are very, very different. Of course there was, at least as far as I am aware, no indications of imminent attack against the U.S. diplomatic facility in Benghazi. Current circumstance is very different in Iraq where there is an imminent threat. It's very present and it's known. So the -- the level of preparation, I think, is much more significant in Iraq today than -- than it was -- than was possible in -- in Libya in 2012. RADDATZ: Thanks very much, General Ham. So what about this group, ISIS? We know so little about them. The army of jihadists surprised just about everyone with their fast and violent sweep through Iraq. And now, Vice News has captured stunning new images of the faces behind the terror. RADDATZ (voice-over): The Islamic militant group ISIS in Syria and Iraq is so extreme that traditional al Qaeda has disavowed it. And now, from Vice News, video from inside the militants' stranglehold -- surreal scenes from the Syrian city of Raqqah -- families enjoying the coolness of the Euphrates. But even here, there is always something more sinister, even with the children. RADDATZ: And what happens in Syria affects Iraq, and vice-versa. The treasures from the march on Baghdad are proudly paraded through Raqqah, along with new recruits from around the world. RADDATZ: Here, the group is known simply as IS, or Islamic State. At a nighttime gathering, recruiting continues -- "Beautiful virgins are calling. Enroll me as a martyr, this man sings." A call and response to excite the crowd. RADDATZ: Joining us now, Kevin Sutcliffe from Vice News. The people you had embedded there, what do they tell you about how this group has grown to rapidly and advanced so far? KEVIN SUTCLIFFE, VICE NEWS: Well, less than a year ago, when Vice -- we started covering the whole issue of Syria, ISIS, as they were then, were one of the small factions fighting for the Islamic factions. And they were just in the mix in -- in the civil war in Syria. They've professionalized. They've added a command and control structure. They are an army now. And you can see the way they swept across into Iraq, dissolving the border and establishing the caliphate. That this is -- this is a force to be reckoned with. They've now got weapons they have looted from Iraq. They've brought them back to Raqqah, as you saw. A filmmaker was in Raqqah for a few weeks. SUTCLIFFE: Americans weapons, (INAUDIBLE) tanks. They were -- he was there for three weeks and he saw how they're establishing a state. RADDATZ: How do they hold territory? What's going on in these towns where they're holding people in Iraq, like Mosul? SUTCLIFFE: Well, in a town like Raqqah, we filmed religious police walking around enforcing the law. The law is Sharia law, which is a very, very hard line Islamic interpretation. Minor infractions we see in our film or post (INAUDIBLE) which is a bit of a Western film poster. The demand is to take down woman at all, to put hijabs on, to cover. The -- the -- this is done at the point of a gun. The religious police are armed and everybody knows that you will be going to prison and a judge -- a Sharia judge could give you an amazing punishment. RADDATZ: But you've got the air strikes going on now around Erbil. What do you think the effect will be? SUTCLIFFE: I think that it's a -- it's a pinprick over to one side. They've got 30, 40 percent of the territory now. They are expanding. They are expansionist. I think they will welcome the attention and the air strikes have brought them, the world attention. And I think they -- they -- they have no fear. You know, they're on a mission from God. They're very fundamentalist in the way -- in their approach. And I think that we're just going to see more of this, we're not going to see less. They -- they are on the march. RADDATZ: Very, very frightening stuff. Thank you very much for those reports. Up next, the college sports stunner -- will a new court ruling lead to big payouts for student athletes? The NCAA president responds live -- his first interview since the decision came down. Plus, brand new details on the Ebola emergency. We're on the ground with virus hunters racing to identify the next outbreak. RADDATZ: Now our Closer Look at an earthquake in the billion dollar world of college sports. A federal judge ruling in some instances, student athletes should get paid. The president of the NCAA is standing by live to offer his exclusive first response to the ruling, after this from ESPN's Tom Farrey. TOM FARREY, ESPN CORRESPONDENT (voice-over): It's a sweeping ruling that could forever change college sports, opening the door for student athletes to cash in from their play on the field. Federal Judge Claudia Wilken writing Friday that college players should be able to, quote, "Receive a limited share of the revenue generated from the use of their own names, images and likenesses." At the center of the case, former UCLA basketball star, Ed O'Bannon, MVP of the Bruins 1995 NCAA Championship. When he saw his image used in a videogame five years ago, he decided to sue the NCAA. ED O'BANNON, FORMER BASKETBALL PLAYER: I realized that I hadn't been compensated or even told that I was going to be on this videogame. And I just thought that that was wrong. FARREY: It's an argument NCAA critics have made for years, that college athletes should share in the billions in profits from college sports. The impact of the ruling, beginning in 2016, players can receive annual payments covering full college costs and universities can set up trust funds capped at $5,000 a year per player. O'BANNON: Look, it's a start. It's something. At this point, anything is better than what the players -- the athletes were getting. FARREY (on camera): Why has this case, this claim, meant so much to you? O'BANNON: This has never been about me. This has always been about the rights of the athletes, present, past and future. FARREY: And that huge decision comes just one day after another major change in college sports -- the NCAA's board voting to allow its five largest and wealthiest conferences to essentially play by their own rules and expand benefits to athletes, including more money to cover full college costs and greater health benefits. UNIDENTIFIED MALE: I think the -- the story line on this is that student athletes win. We all know it costs more than room, board, books, tuition and fees to go to college. And this is reflective of that. FARREY: But many believe the NCAA's decision was simply an attempt to keep these large, revenue generating conferences known as the Power Five, from walking away. UNIDENTIFIED MALE: I think this absolutely was a reactionary move by the NCAA. I think they were very concerned that the Power Five conferences could split off on their own, because they would definitely survive without the NCAA's help. They've got the products because they've got the players and the schools that matter. FARREY: For the average fan, it's unclear whether this week's actions will change the game on the field, though the strong will get stronger. UNIDENTIFIED MALE: Most people already believe there's a chasm between non-Power conference schools and the Power Five, but it's only going to get even greater right now. And within the Power Five itself, you're going to see an arms race where people will start spending more money on not only their facilities, but actually directly into student athletes' pockets and that is a very slippery slope. FARREY: For THIS WEEK, Tom Farrey, ESPN, Henderson, Nevada. RADDATZ: Conference schools and the Power Five, but it's only going to get even greater right now. And within the Power Five itself, you're going to see an arms race where people will start spending more money on not only their facilities, but actually directly into student athletes' pockets and that is a very slippery slope. RADDATZ: All right, thanks to Tom. 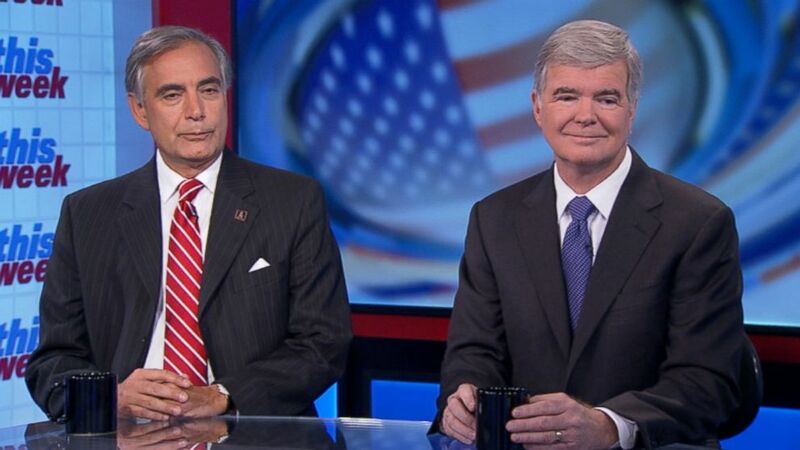 Joining us now in his first interview since that big court decision, Dr. Mark Emmert, president of the NCAA, along with Dr. Harris Pastides, president of the University of South Carolina and a member of the NCAA's board of directors. I want to start with you, Dr. Emmert. First on the O'Bannon ruling. You testified during the trial that the definition of amateurism boils down to you're not paid. So does this ruling turn college sports into pro sports? DR. MARK EMMERT, PRESIDENT, NCAA: Well, I think it potentially could. There's a lot in the ruling that I think is admirable and that's consistent with arguments that we've been making all along. And there are some things about it that we really fundamentally disease -- disagree with, most notably, we disagree that there's a violation of anti-trust laws going on here. And we'll probably continue to argue that in the coming months and beyond. But it -- it has the potential to fundamentally shift intercollegiate athletics in ways that many people are concerned about. RADDATZ: So will you appeal the decision? EMMERT: Yes, at least in part, we will. Again, no one in our legal team or in the college conferences legal teams believes that the -- the current rules are violations of anti-trust laws and we need to get that settled in the courts. RADDATZ: During the trial, Ed O'Bannon said, "I was an athlete masquerading as a student. I was there strictly to play basketball. I did basically the minimum to make sure I kept my eligibility academically so I could continue to play." Can you really argue that these types of athletes are amateurs? EMMERT: Well, it's a decision that Mr. O'Bannon made when he was a -- a student, right? He had every opportunity to do as much as he wanted in school as he desired. He got a degree from the university and many, many, many thousands of student athletes take full advantage of the opportunity to be both a student and an athlete while they're in college. And the vast majority of them graduate. More graduate than -- than the students who aren't student athletes. So I believe strongly, and, more importantly, the evidence demonstrates, that, indeed, they are students. RADDATZ: Dr. Pastides, I want to turn to you. The judge set a potential cap on payments to athletes at just $5,000. But schools like yours in South Carolina make millions of dollars on these athletes. So should they be paid more than a few thousand dollars? DR. HARRIS PASTIDES, PRESIDENT, UNIVERSITY OF SOUTH CAROLINA, MEMBER NCAA BOARD OF DIRECTORS: Well, Martha, I think that the governance reform that was passed last Thursday allows us to do this. I think that's the right context for doing that. Sure, we need to share more of the resources with stay with us. My own coaches have said that. We need to provide them what we call the full cost of attendance, better health and safety benefits, better professional counseling. So I think a lot of people who are looking at this ruling and -- and celebrating on behalf of the student athlete don't realize that what we did last week in Indianapolis is really the right path for allowing us to do that. RADDATZ: I -- I want to turn to the major decision by the NCAA board of directors this week. It gives more freedom on rules to the -- the five biggest conferences. isn't there a bit of a contradiction here? You oppose pay for players, but you're now allowing these big conferences to give these players more benefits? EMMERT: Well, what the -- what the members did last week was allow the five highest resourced conferences to make decisions about a handful of -- of cases around student well being, mostly the things that Dr. Pastides was just mentioning. And it also allows the other schools, it's permissive for all the schools to do the same thing. And so this is a topic that's been under debate and discussion for more than three years, about how to reach full cost of attendance, how to provide student athletes more support. There's very little doubt and debate about the need to do that. And I and Dr. Pastides and many others have been advocating it for years. And I think this move will finally allow us to get there in a -- you have to recognize that the association is a very democratic process. It's not as if any one person can change the rules. It's a bit like asking Congress to do something and that takes a while to get there. And this new move will allow those decisions to happen more effectively. RADDATZ: Let's talk about the impact on the game. What does this do to the competitive balance? Is it really, as was mentioned in Tom Farrey's piece, the haves and have-nots now? PASTIDES: Well, Martha, there's always been great diversity even within Division One. There's no doubt that some -- some teams and some conferences are more successful year after year. But what we passed in terms of legislation is absolutely not meant to exacerbate that. RADDATZ: And it doesn't start an arms race? PASTIDES: Well, there already is an arms race, right? RADDATZ: Does it make it worse? PASTIDES: Uh, well, I don't -- I don't know. We'll have to wait and see. But the arms race today is around facilities and support staff. It's -- it's not been focused on providing student athletes with the things that they need. And so the changes that are being proposed by the 65 schools and those Big Five conferences are aimed entirely at supporting student athletes. I think the unfortunate thing about this whole debate is it's been -- it's been cast in many cases as the -- the member universities and the NCAA trying to withhold support for student athletes. And that's not the case at all. There is a huge debate about whether or not this is an anti-trust violation, the way the rules are imposed. but I think there's much in the judge's ruling that's -- that's useful, that says, look, all student athletes have to be treated the same. And, yes, the NCAA, as an association, can impose a cap, it just can't be below these sort of thresholds. So there's implicit recognition in her ruling that much of what we do today makes good sense. RADDATZ: No matter what, very big changes this week. RADDATZ: And probably some very big changes coming. RADDATZ: Up next, Ebola emergency -- the latest on efforts to contain the outbreak. Plus, why do experts say we may not be ready for the next viral threat? And later, the drastic step one city is taking to fight crime. But first, the Powerhouse Roundtable's big winners of the week. RADDATZ: Now to the global alert over Ebola. This morning, the outbreak in West Africa continues to spread. The World Health Organization declary it -- declaring it an international public health emergency. The latest numbers -- more than 1,700 infected, more than 960 people dead. and here in the U.S., new worries over whether we're prepared for future viral threats. Here's our chief medical editor, Dr. Richard Besser. DR. RICHARD BESSER, ABC NEWS CORRESPONDENT (voice-over): Hollywood has given as the catastrophic scenario in movies like "Contagion." UNIDENTIFIED MALE: When did we run out of body bags? UNIDENTIFIED MALE: Two days ago. BESSER: A killer virus raging out of control. And in West Africa, it's what experts say is happening right now. In Liberia, health workers in protective gear struggle to collect bodies from terrified residents, trying to keep the healthy away from bodily fluids that transmit Ebola. UNIDENTIFIED FEMALE: Do you know when the person in this house died? UNIDENTIFIED MALE: Yes, this morning. Yes, early this morning. BESSER: And while this new outbreak shows the horrors Ebola can unleash, it's not the only viral threat out there. UNIDENTIFIED MALE: Influenza, I think, is still one of those we need to really keep an eye on. It's always surprising us by doing things we're not expecting. BESSER: Just five years ago, H1N1, or swine flu, killed more than 150,000 people. In 2002, 8,000 cases of another virus, SARS, raised alarms in Asia. And HIV has killed 30 million. And while a successful treatment was eventually developed for HIV, for Ebola there's none yet. Like many viral threats, Ebola was likely introduced to humans through animals who carry it without getting sick. UNIDENTIFIED MALE: What our work is focused on is understanding what's out there that could potentially harm us. BESSER: Three years ago in Cameroon, we joined Nathan Wolf, a virus hunter who scours the African rainforest to identify new contagions that might be slumbering in the jungle before they find us. When humans come in contact with their blood, either hunters or people preparing animal meat, a virus can jump to people. Wolf and his team monitor not only the animal blood, but the blood of local hunters in drops stored on cards. How many of these cards have you collected so far? NATHAN WOLF, VIRUS HUNTER: Almost 20,000. And this looks like the kind of lab I might see at the CDC. BESSER: The hunt for crucial links, which so far have proved elusive. UNIDENTIFIED MALE: There are a lot of things we don't know about. And the fact is that we've never correctly predicted or even predicted at all any pandemic or emerging infection like an Ebola outbreak until it hit the human population. BESSER: Worrying sign for the future as experts raced to contain the latest outbreak. RADDATZ: Our thanks to Dr. Besser. Let's take this on now with our experts Dr. Frank Glover is a medical missionary who worked in Liberia with the Christian charity SIM. And Robin Sanders is the former U.S. ambassador to Congo and Nigeria. Welcome to you both. Dr. Glover, I want to start with you. It seems like the two patients who are now in Atlanta re doing much better. Are we out of danger of the virus spreading within the United States? DR. FRANK GLOVER, SIM: Well, no we aren't that danger -- this is an international public health emergency, the World Health Organization just declared on Friday. And we're still seeing new cases and new suspected cases popping up in places like Europe, Canada and of course in Nigeria. RADDATZ: And back to Africa, you warned congress this week that unless something is done, this Ebola outbreak could spread tens of thousands. What has to happen in order to prevent that? GLOVER: Well, what has to happen is immediate protective gear must be given to the workers that are on the ground. There's been a large death toll from the nurses and doctors that are trying to treat this disease. The health system is completely collapsed. And by that I mean they don't have capacity even to see patients. Every day they're seeing patients present, mothers present with dead babies in their womb because there's no one to do a c-section. RADDATZ: And they're not really getting these protective suits. They're not getting what they need. RADDATZ: Ambassador Sanders, you were the ambassador to the Republic of Congo during previous outbreaks. Those outbreaks were in 2002, 2003. Why is this outbreak in Western Africa different? ROBIN SANDERS, FRM. U.S. AMBASSADOR TO CONGO, NIGERIA: Well, the main reason is the population density. In Congo, they were in remote areas. This is population density in Monrovia and Liberia, certainly in Nigeria the population lives very closely together. So it's very difficult to quarantine. And it's easier for the spread of the virus, because you have such close quarters. RADDATZ: Both of you, you've talked about what needs to happen. What will happen, what can happen? It seems like this is desperate and this is just going to go on. SANDERS: Right. There are a couple of things. One, I think the civil aviation authorities as well as the border patrol authorities across all of the countries that are affect need to communicate better. They need to ensure that they are not only quarantining, but having zones of movement. I think one of the things that gets left out of this discussion in terms of how the virus gets into the human population is a food security issue. And you're facing that now in Liberia where people are quarantined. They were not told in advance and therefore there are food shortages in those same areas. How the virus sometimes gets into the population is that people are food insecure so they eat bush meat, rodents that are infected with the virus. RADDATZ: Just very quickly, Dr. Glover, to the people in the United States. What would you say in terms of being afraid of this? GLOVER: Well, I think that our health system is obviously much well resourced and we have the capacity, isolation centers in hospitals all over the country. So this isn't something we should panic about, but it's something we should be concerned about. And the CDC has made recommendations to the doctors in this country about what precaution to take, people coming from West Africa or affected countries would need to be isolated. And to be sure they don't develop symptoms. RADDATZ: And it seems like they're doing a good job with that so far. We hope that continues. Thanks very much for joining us. Coming up, Baltimore's bold new move to prevent crime. Is it criminalizing childhood? But before we go to break, our powerhouse puzzler inspired by yesterday's 40th anniversary of President Richard Nixon's resignation. Nixon was, of course, known for that notorious enemies list. So here's the question, name the celebrity on Nixon's enemy list who joined Instagram this week. And here's a clue, the person posted this picture with their dog. RADDATZ: So who is the celebrity on Nixon's enemies list who joined Instagram this week? UNIDENTIFIED MALE: I said Donald Trump, because only he would own a dog like that. UNIDENTIFIED FEMALE: Cici (ph) is a good guess. RADDATZ: Whatever. No one got it, OK. The answer, Barbara Streisand. There you go. Up next, the firestorm over a city's curfew for kids back in 60 seconds. RADDATZ: We're back with the political uproar after a major American city takes a drastic step to make streets safer. But is a curfew the best and fairest way to bring down youth crime? ABC's chief national correspondent Byron Pitts now on the front lines in his hometown of Baltimore. BYRON PITTS, ABC NEWS CORRESPONDENT: It's been years now since HBO's The Wire was on television creating a reputation the city of Baltimore is still trying to live down. UNIDENTIFIED MALE: Tell that boy he ain't man enough to come down to the street with Omar. PITTS: So far this year, relative good news the overall murder rate is down, but no one is celebrating, in part because the number of young people dying is up. So what's a cash strapped city to do? Thus far, the public has not liked the answer. Considered one of the most restrictive in the nation, Baltimore has upgraded its 20 year old curfew law. Children 14 and under off the street by 9:00 p.m., 14 to 16 year olds by 10:00 weekdays, 11:00 p.m. on weekends, parents or guardians could face fines of up to $500. But it's not the fine or the hours that bothers critics and civil liberties groups. You're a school teacher in Baltimore. From your perspective, what's wrong with having a curfew for children? UNIDENTIFIED MALE: I think it's offering a chance to criminalize children. PITTS: Baltimore mayor Stephanie Rawlings Blake insists that's not her goal. We rode around the city with her after dark to see for ourselves how often and how many children are outside unsupervised well into the night. STEPHANIE RAWLINGS BLAKE, MAYOR OF BALTIMORE: When I was growing up, when the street lights came on, you were supposed to be in the house. Somebody, some adult needed to know where you were. Period. Now they turned it into some type of civil rights issue for kids. PITTS: I'm struck by how you (inaudible) about this. You sound more like a parent than a politician when you talk about this particular issue. BLAKE: I am a mother. It broke my heart going to that curfew center at 12:00 at night and seeing 6 year olds and 7 year olds coming in there. They're not there by choice. PITTS: Here's part of the pushback that I've heard from people is that once you introduce children to the criminal justice system in any form or fashion that you begin to criminalize them. PITTS: City councilman Brandon Scott proposed the new curfew, which includes what's being called youth centers where police will bring the children until an adult or guardian is located. UNIDENTIFIED MALE: In the past, we were actually sending parents to jail for their kids in curfew and they would think the kid is going to be -- the next night they're going to be right back out on the streets. So making it a common sense, but making it about actually helping and not criminalizing. PITTS: The response from teenagers on the street after hours is about what you would expect. One at a time. So, yes, sir, what do you think about the curfew. UNIDENTIFIED MALE: I don't like the curfew laws. UNIDENTIFIED FEMALE: Égot to go in the house. UNIDENTIFIED MALE: It's summer time. It's summer time. Why can't we just chill on the block for real? PITTS: More than teenage bravado, the Baltimore Police Department has a bigger issue: seen in many neighborhoods here as part of the problem, enforcing the new curfew law will be a challenge. UNIDENTIFIED MALE: I'm here to change the culture. I'm here to reform our organization. I'm here to change the dynamics of what has happened or will happen in the future. PITTS: But perhaps the real test for this old American city in my beloved hometown will come in the months ahead. Will the new curfew not just keep kids off the street, but put them on the road to safer and productive lives. For This Week, Byron Pitts, ABC News, Baltimore. The roundtable is here now. ESPN's LZ Granderson who is also a CNN contributor; Sharyl Attkisson, investigative journalist and author of the new book Stonewalled; ABC's political analyst Matthew Dowd; and Cokie Roberts. Welcome to you all. And Matt, let me start with you. The Baltimore solution, it's not an easy thing to implement. Do you think it gets to the root of the problem? MATTHEW DOWD, ABC NEWS POLITICAL ANALYST: Well, having grown up in Detroit with 10 brothers and sisters, my mom always said nothing good happens after 10:00 at night, so don't be out anyway. And that was 40 years ago. I worry about this. Obviously the parents and everybody wants to protect their children in the midst of violence and violent crime in these cities, but I worry about we've tended now towards a much more militarized police force. It's not only now they have more rules, more ability to pick up, more ability to frisk, all of those things, but we also now are empowering them with the tools that we only used to use for the military -- trucks, guns, all those sorts of things. And to me is this is a responsibility of parents, obviously, which we're not necessarily dealing with it. I worry about giving too much power to the police force. RADDATZ: And LZ, does it really say stop and frisk anybody? Are you worried that it goes to that? LZ GRANDERSON, ESPN: Well, absolutely. I don't understand how in country in which we've seen vigilantes running around enforcing their own laws shooting unarmed black people -- we just saw the NYPD choke hold a man to death in New York -- how you can pass this curfew suggesting that it's OK for police officers to stop someone who may look young and ask for their ID and think nothing bad is going to happen. ROBERTS: Oh, but come on. They do look young because they are young. And it's very interesting, the people who are for this curfew are the moms. The moms are absolutely for it, because they want their kids to be safe. And if -- you know, if the streets were in this kind of situation in my neighborhood, the National Guard would be there. RADDATZ: But Sharyl, can you make the moms more responsible, and the dads I'll throw in there? SHARYL ATTKISSON, JOURNALIST : I think it's a tough situation, which I tend to defer to local community to work out. As a parent, I would have a problem with the curfew. I kind of liken it to truancy. I was in Tampa some years back when they would pick up kids off the street that looked young, they looked like they should be in school and they didn't criminalize them, they returned them to the parents or to a supervised setting. If it's something like that and it works for them, great. If it doesn't work for them, I think it's up for them to figure that out. RADDATZ: LZ, I want to turn -- we're going to be all over the place here, because there's so much happening. But I want to turn to the NCAA decisions and what effect do you think this will really have -- the O'Bannon certainly. Is amateurism dead? GRANDERSON: Well, if there is a gender (inaudible) right now I think that would the main peg that just got removed, right, and the whole thing is going to come tumbling down. The fact of the matter is, is that sports -- sports journalists have been clamoring about what they see is the immorality of the NCAA for years. And now there's -- there's now law, it's now a decision that's been brought down by a judge now that gives sports even more ammo. And as the media presses more, eventually you're going to find a congressman or congresswoman who is going to want to take this issue up on the Hill, because they're trying to get reelected or they need something to get behind. And it's going to really force the NCAA's hand. RADDATZ: And then quickly, I want to just ask quickly because we've got to move on and we're going to talk about Nixon in a minute, I want you talk about that. Tony Stewart, there was a very tragic accident, the racecar driver, he killed another driver after the car spun out. And he's going to be back driving 12 hours later in NASCAR. GRANDERSON: If NASCAR wants to have a good look, it would not allow that man to get back on the road. Not to say that what happened he did on purpose, but it just is not good optics for your sport. I do want to turn to Richard Nixon. Forty years ago, Richard Nixon resigned. Cokie Roberts, hard to believe. You were already a reporter at the time. ROBERTS: Well, you know, it's interesting. Actually I -- we had covered all the Watergate, the lead-up to the resignation, for the actual resignation I was living in Athens, Greece. My husband and I were reporters there. And watching that from afar was really quite something. But what it did teach us in a very important way was the tremendous strength of the American system. And I remember a congressman coming afterwards and saying you know the commander-in-chief of the United States armed forces was forced to leave office and not one soldier left his barracks to defend him. And of course it never occurred to us that something like that would happen, but it was very important lesson. RADDATZ: And probably a reason Sharyl is an investigative reporter. DOWD: I was fascinated by it. I watched the hearings when I was in vacation in Michigan. I loved it. I think that we're still dealing with the aftermath of that 40 years later. We now are -- we lost a sense of leadership. We don't trust leadership. We moved from skepticism, which I think is very good, to cynicism. And much of that movement in our country and our political leadership happened in the midst of Watergate. I think the advancement of journalism, the transparency that was created at the time was great. But we've also lost a sense of idealism in our political leadership in Washington that we're still dealing with. ATTKISSON: I think that we've gone backwards since that time when we really felt empowered as journalists. And I like to think as what would happen today during a Nixon type scandal, Nixon would basically refuse to turn over tapes to congress, his aides would refuse to testify to congress or would take the fifth or would lie to congress with fair amount of impunity. Woodward and Bernstein will be controversialized on social media by special and political interests. ATTKISSON: -- Facebook accounts. And then at the end, Nixon would go on a popular late night comedy show during which time he would humorously refer to his attackers as people that were political witch hunters who believe in Area 51 type conspiracies. RADDATZ: Well, I am going to just hope that people like you will keep pounding investigative journalists and get something done. GRANDERSON: Actually, I was 5. GRANDERSON: I was alive. Barely, but I was around. You know, the thing that I find fascinating is that we're still focusing on Watergate, which unfortunately overshadows all the wonderful things that he was able to do especially on foreign policy. He created the EPA, you know, which I'm sure Republicans now hate, but the fact of the matter is that was a good thing particularly at that time. And as we're having a conversation about legalization of marijuana, he started the war on drugs. He was the one that put marijuana in the subject one characterization that marijuana now has. And as we're debating whether or not it should be legalized, it all goes back to Nixon. RADDATZ: OK. And we'll go back to foreign policy, because coming up next military action in Iraq, how will it impact the legacy of the president who ended the war? BARACK OBAMA, PRESIDENT OF THE UNITED STATES: I don't think we're going to solve this problem in weeks, if that's what you mean. I think this is going to take some time. RADDATZ: That was President Obama yesterday, talking about military action in Iraq before heading to Martha's Vineyard for a working vacation. And we're back now with the roundtable. Matt Dowd, I was struck by something Peter Break -- Baker wrote in "The New York Times" this week, that "Obama becomes the fourth president in a row to order military action in that graveyard of American ambition." DOWD: Well, to me, this is -- the decisions that have been made on previous presidencies, especially the presidency which I served with, President Bush, in 2002 and 2003 and our entree into Iraq, we're going to -- not only is President Obama going to be dealing with, but the next president is going to be dealing with it. This what -- this is, to my view, if you broaden this, this is exactly what happens. We have a humanitarian crisis. We have a global crisis. It's when we don't align moral objectives with long-term strategic goals. It's the paradox of presidential leadership where you have to not only be -- have idealism, but realism. And we've had presidents in a row that basically had idealistic ideas. President Bush was very idealistic. But he -- he approached the global stage in the aftermath of this unrealistically. And I think President Obama was dealt a bad hand but has played it badly. When we have a presidential foreign policy that is not strategic, it's ad-hoc. And it's an inept president on a global stage and we're the last superpower? ROBERTS: Well, we're not acting like a superpower, that's the problem. And so that, you know, I -- I agree with Hillary Clinton, as you quoted her earlier, saying well, if we had gotten into Syria when the rebels were begging us to come in and saying here we are, trying to secure our freedom, where is America, then you wouldn't have had this group filling the vacuum. RADDATZ: -- have people on the ground. RADDATZ: They're not there to just walk around and show their guns. ATTKISSON: And I would argue it may be time for someone to develop, in the United States, a policy that's bigger than going from country to country and treating them like they're small paradigms that are independent of one another. What is our global, or if not global, regional strategy? Is it to contain terrorism, al Qaeda and Islamic fundamentalists? Is it to beat it back to different areas? And how are we going to accomplish that? We don't have that strategy. And there are people inside the government who believe we ought to have such a thing. RADDATZ: -- and has seen what happened -- has happened this week and over the years in Iraq. GRANDERSON: I think the more we have this conversation and the more that we don't say two words -- religion and oil, the further away we get from the real problem. I think part of the reason why we don't have the same sort of influence in the Middle East than we all think that we should have is because we're making so many decisions not based upon real humanitarian effort, but because it's in the best interests of America. And what's the best interests of America? DOWD: To me, this is what happens when -- in the history of our country, when done well, foreign policy done well, is we don't get overly involved in regional conflicts. We use regional conflicts -- our involvement in regional conflicts is temporary, not permanent, and we do it in a sa -- in a strategic sense. DOWD: -- and they've not been temporary. RADDATZ: A one word answer -- does this consume the president for the rest of his term? ROBERTS: Yes, I think so. And next, a personal note about U.S. troops in Iraq after this from our ABC stations. RADDATZ: It has been nearly three years since the U.S. pulled its troops out of Iraq and President Obama declared the war over. I was with U.S. soldiers on the last U.S. convoy out of Iraq on that December day in 2011, after covering the war since the beginning. And I was with the U.S. commander on the last helicopter out of U.S. military heada -- headquarters after the Americans officially handed it over to the Iraqis. RADDATZ (voice-over): It was a somewhat somber day -- no celebrations, just a simple ceremony at U.S. military headquarters' Camp Victory, clearly named prematurely. But on that day, there was nothing but pride and hope for the future. UNIDENTIFIED MALE: Your sacrifice has helped the Iraqi people begin a new chapter full of hope for prosperity and peace. RADDATZ: Deanie Dempsey, wife of the current chairman of the Joint Chiefs of Staff, General Martin Dempsey, cried talking to me that day. It was the first time she had seen this country where her husband, son and daughter had all served. DEANIE DEMPSEY, WIFE OF JOINT CHIEFS CHAIRMAN MARTIN DEMPSEY: It's pretty amazing. What the American culture has done to help this country is nothing short of miraculous. RADDATZ: We flew above Baghdad after the ceremony with the last commanding general of U.S. forces in Iraq, General Lloyd Austin, pointing out his old headquarters and how different the city looked from 2003, after the initial shock and awe invasion. (on camera): The sight of Baghdad. RADDATZ (voice-over): And I was with our soldiers for the final ride out of the country, with a memory of those who did not make it home, those 4,487 Americans who gave their lives in this war, was still fresh. UNIDENTIFIED MALE: There's a lot of soldiers that made the ultimate sacrifice in that unit. And when we cross in today, you know, like we're finishing up for them. RADDATZ: But as dawn broke and we crossed into Kuwait, there was great relief that the war was behind them. UNIDENTIFIED MALE: We made it! Whewww! Whewww! RADDATZ: And yet, I look back on what I said that day and what many others were feeling, that the relief might only be temporary. (on camera): The war is not over for the Iraqis. Iraq remains a very dangerous place and there is a huge threat of sectarian violence and also al Qaeda coming back in. (voice-over): Because war never goes the way you expect it will go, even when you say it's over. RADDATZ: In fact, General Austin, who I said good-bye to Baghdad with from that helicopter, now heads Central Command and is overseeing the air drops and the air strikes. RADDATZ (voice-over): This week, a two star general, Harold Greene, joined the ranks of thousands who have given their lives.